Lazy test subjects are needed in an effort to research the long term effects of space exploration on astronauts. When looking towards achieving manned missions to other planets, you are often looking at a long flight time that cannot be helped by holiday travel comparison sites. The lack of physical exertion on astronauts in zero gravity can cause their bodies to deteriorate, with losses in bone and muscle density being among the most prominent effects. This can cause major issues with the reintroduction of gravity when coming to performing tasks on other planets, not considering the stresses on the body experienced when entering an alien atmosphere. NASA has long been researching ways to combat the effects of weightlessness and inactivity on the body. Now, an experiment has been re-opened to the general public to lie in bed for 70 days to investigate the effects of space exploration on the human body. 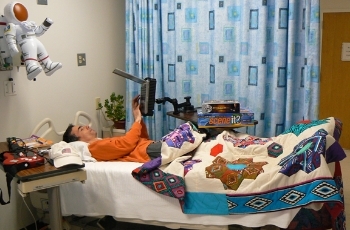 The long-term bed rest study is based in NASA's Human Test Subject facility at The University of Texas Medical Branch (UTMB), Galveston. Although you might not expect it, there is a criteria for those seeking to join. Beyond the usual medical checks including a drugs and alcohol screening, every participant is expected to pass the Modified Air Force Class III Physical test. NASA is seeking to emulate the same physical condition an astronaut would be in as closely as possible. "We don't want couch potatoes for this study," says researcher Ronita Cromwell of the Flight Analogs Project. Unfortunately for half of the subjects, the title given to the experiment is misleading. The volunteers will be split into two groups. The first will lie in bed for 70 days at a six degree downward tilt, this group experiences the cardiovascular symptoms familiar to astronauts. The second group will participate in a "variety of resistance and aerobic exercises," all whilst remaining in bed for the same period of time. In both groups, sitting up is not allowed. Devices have been created to help them shower and go to the bathroom whilst staying reclined. The groups sound like polar opposites of each other, but both will engage in a series of simple tasks whilst in an MRI machine, so there is some activity involved for the first group as well. After the 15 week testing period, both groups will be stood up and asked to perform a series of simple tasks like walking a certain distance, lifting boxes and using equipment. The idea being that this is the same experience astronauts will have straight after landing on another planet. For temporary expeditions, time can be a valuable asset that can't be wasted. It is unknown just how long it would take for astronauts to readjust to a gravity environment. After testing is done, all participants will undergo a two week recovery program to help get back on their feet before going home. It is definitely a unique way to earn some money, whilst at the same time aiding the scientific progress of future NASA missions. What researchers found most interesting and unexpected about this experiment is that many past participants often request to come back for future programs.